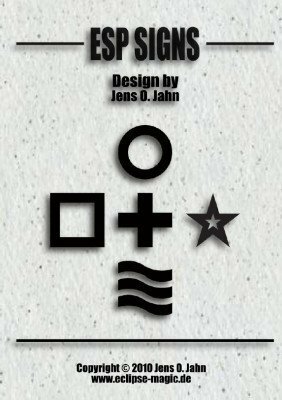 One star version is geometrically the same size as the other symbols. Due to its shape it looks a bit smaller than the other symbols. The second star design is 20% larger to better match the overal appearance of the other symbols. But that is not all you get. There is a lot more on the back side. First, you get the back in four colors: black, blue, red, and white (inverse of the black design). Second, you get a version of the back that is a subtle one-way version of the regular back. Third, you get a back version for each design that is marked so that you can know from the back which design the card is. This is easy to read once you know what it is, but hard to spot when you don't know what to look for. And fourth, you get a version of the back for each sign that combines the marking and the one-way marking. With these designs you can create literally hundreds of combinations of face, back, marked or not. Additionally to the SVG files you get a PDF that gives you an overview of the available designs, as well as explains the clever marking system.